Observation - Lesser Hawkbit - UK and Ireland. Description: Yellow dandelion type flowers, solitary heads which drooped slightly. Long grean leaves which spread out in a rosette shape, with scalloped edges and rounded tip. Found in abundance on the landward side of sand dunes. 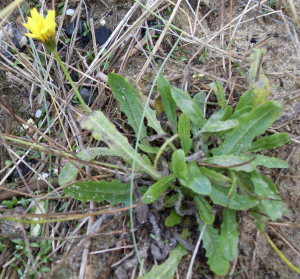 Yellow dandelion type flowers, solitary heads which drooped slightly. Long grean leaves which spread out in a rosette shape, with scalloped edges and rounded tip. Found in abundance on the landward side of sand dunes.